Happy Friday everyone! Is it just me or has this week flew even faster than the last? I guess with school coming to end and parties and birthdays and graduation it has been hectic; in a good exhausting kind of a way. I can't complain. 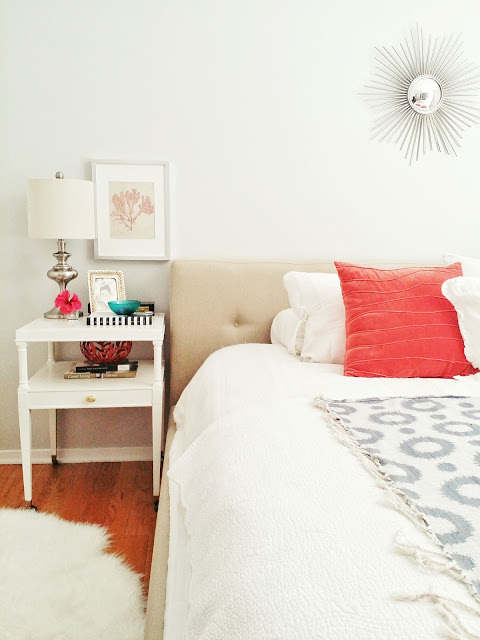 Especially yesterday when I got to stay home with my munchkin and style my bedroom to give you guys a little peek. 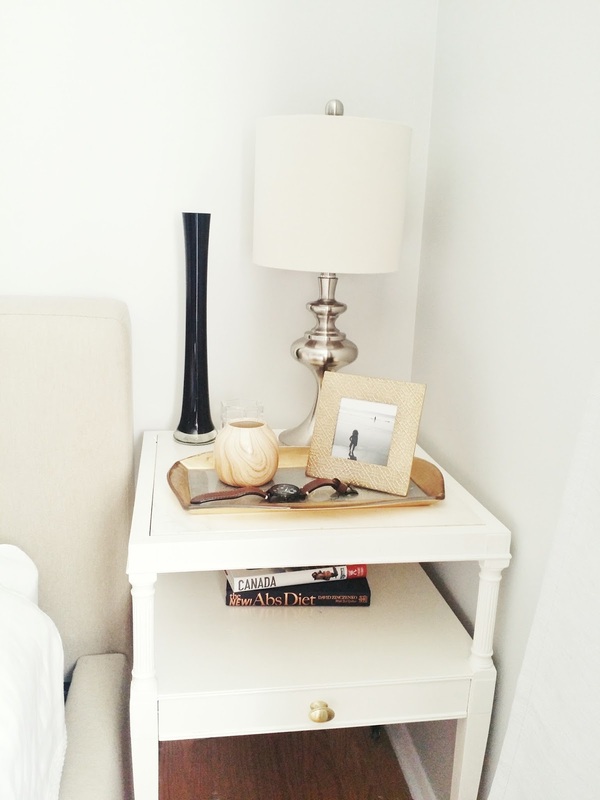 Nothing like a good ol' blog post to motivate a little cleaning and a little styling. I even got to print my favourite pic of Avangeline and place it on my night stand. Yeah! I love my bedroom in the evening. It is painted a light grey but darkens in the evening for a cosy feel. 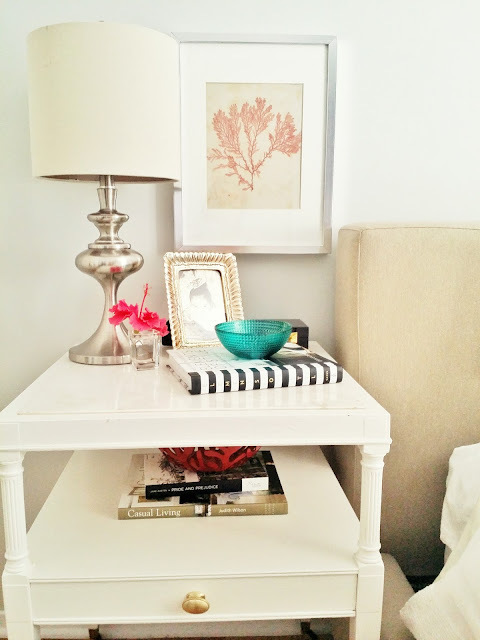 The lamps are from Pier 1 (bought years ago) and I love the brushed stainless finish. One thing I will say about Pier 1 is that their stuff is well made. HomeSense is my favourite store for accessories. 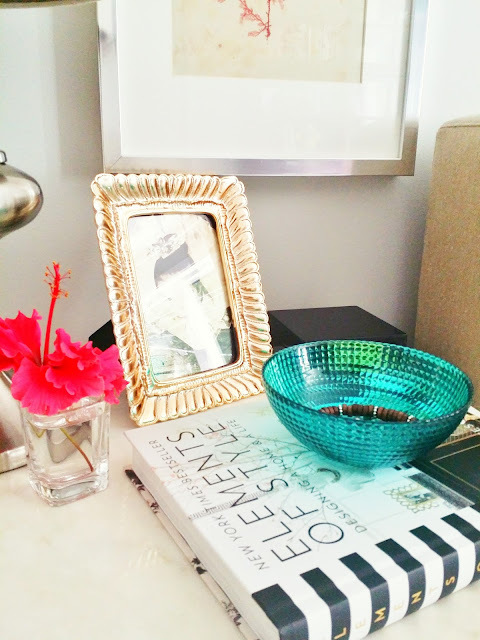 That cute little turquoise bowl from Turkey on liquidation for $2! Gold frame $5! 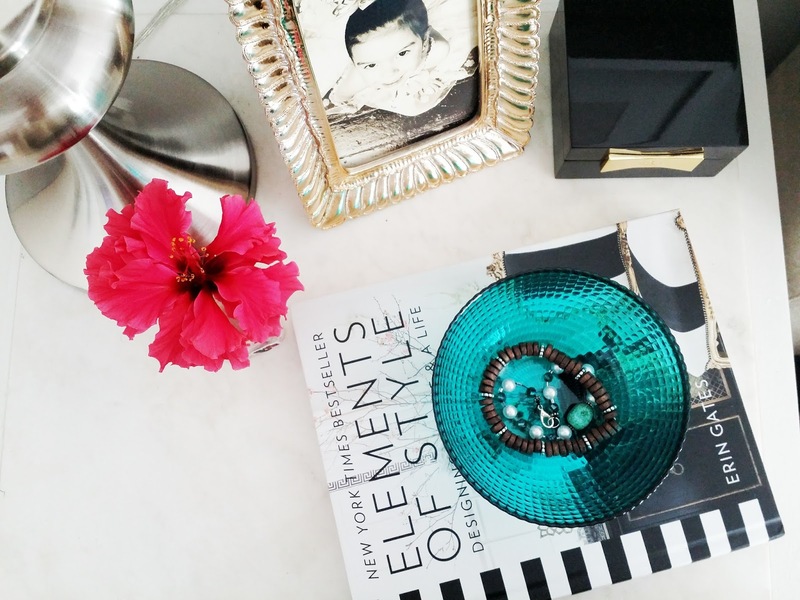 Elements of Style; amazing read from Blogger & designer Erin Gates $24.99! The little black Kate Spade jewellery box was a gift from my girlfriend Lori. I'm pretty sure it's from Chapters. It's the perfect addition. I love it (best shown in 1st photo). I try to keep the room simple, calm, and comfortable. 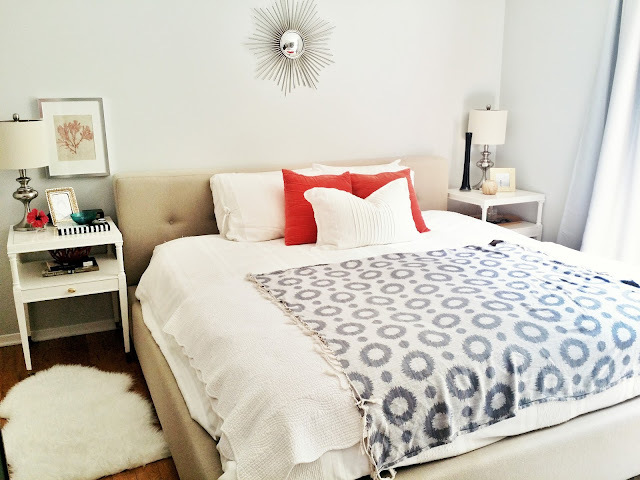 Bedding from Linen Chest & orange pillows from Target. Sunburst mirror Luxe Decor. Obviously I change it up with the seasons but books, picture frames, and bowls for jewellery are staples. Greg's side looks a little more masculine than mine. Although he doesn't really care how I style it; it's all good to him. The upholstered king size bed made from recycled linen is from Maison Corbeil and is made here in Quebec. The night stands were a Craigslist find, and I had them painted a high gloss white a few years back. I love having the library in my room. It's perfect here. I couldn't imagine it anywhere else. It houses all my magazines, books, scarves, throws, and some of Greg's sweaters and jeans. It is multi-storage and it is so useful. The third wall (not shown) is a chest of drawers from Ikea and a TV. Nothing special-yet. I really want to create a beautiful vignette with the TV integrated. It would require buying a new longer, larger dresser. I have a very good idea what I want but it'll have to wait for now. 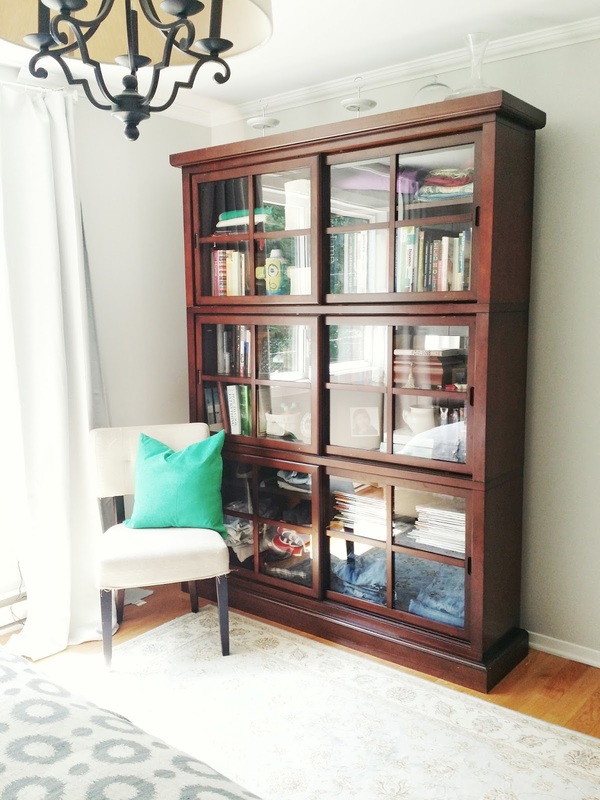 If you haven't seen our closet makeover you can view that here. That was a game changer!